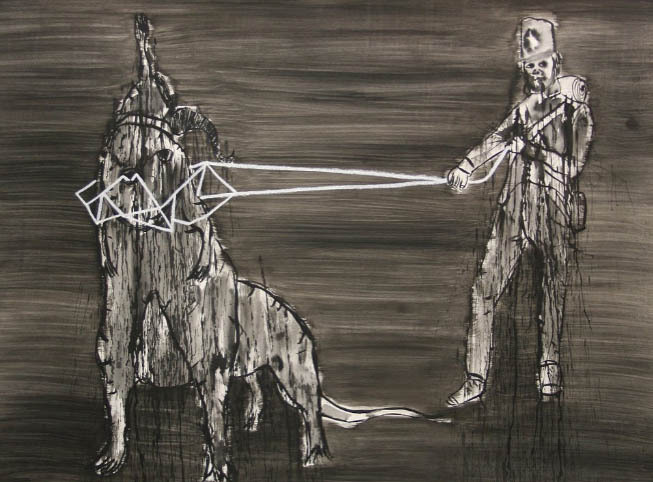 Wade Owen, 'The Strong Lead the Weak', ink and oil on paper, 56 x 76cm, 2010. Launching a solo exhibition while the silly season is in full swing is a bold move, but Flinders Street Gallery have done just that. And not only have they ditched the traditional group smorgasbord, they’ve served up Wade Owen’s Down, a dark and brooding mix of inky drawings that aren’t likely to ever grace a greeting card or chocolate box. Owen’s expressive drawings seem to probe the dark heart of the collective unconsciousness. It may be the season of ‘goodwill towards men’ and ‘peace on earth’, but Owen seems to know that humanity is much more prone to seizing territory and lusting after power than turning the other cheek. 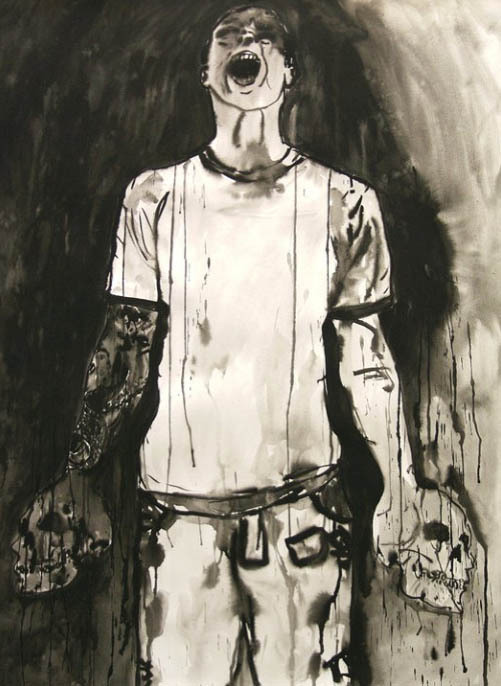 Wade Owen, 'Hard Power (Soldier & Child)', ink on paper, 76 x 56cm, 2010. 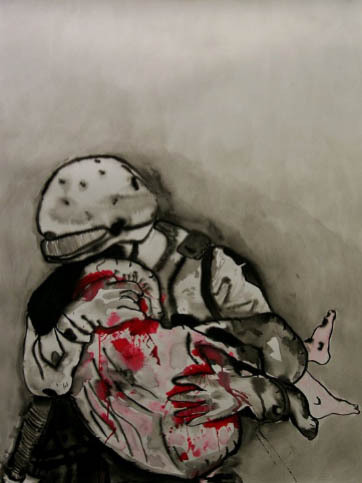 In Hard Power, a soldier cradles a child, bundled and bleeding. Is he a peacekeeper or perpetrator? It probably varies from day to day. In The Strong Lead the Weak, another soldier, this time in colonial costume, seems to have harnessed a mutant creature, but it’s not clear who is in charge. In Conduit, a young man clutches two human skulls and channels his inner demons. Wade Owen, 'Conduit', ink on paper, 76 x 56cm, 2010. If you’ve over-dosed on the saccharine sweet sentiments of the season, Owen’s bleak, perceptive and powerful drawings provide a refreshing antidote. Cheers! Wade Owen: Down is on at Flinders Street Gallery until December 23 and reopens January 26-29.